The Evolution of Ivanpah Solar. Photographs by Jamey Stillings. Text by Bruce Barcott. Foreword by Robert Redford. Introduction by Anne Tucker. Steidl, Gottingen, Germany, 2015. 148 pp., 60 tritone illustrations, 9¼x13½". In this new monograph, Jamey Stillings (born 1955) synthesizes environmental interests with his longstanding fascination with the intersections of nature and human activity. 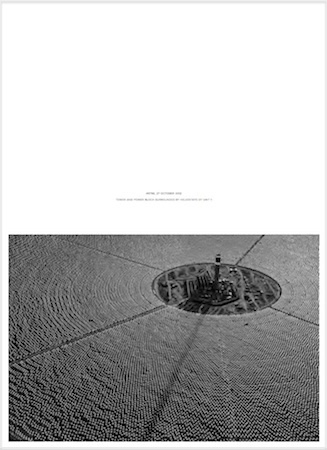 In October 2010, Stillings began a three-and-a-half-year aerial exploration over what has become the world's largest concentrated solar power plant, the Ivanpah Solar Electric Generating System in the Mojave Desert of California. From the simple and stark terrain of the preconstruction landscape to the angular forms of the completed solar plant producing 392 megawatts of electricity on 14 square kilometers of public land, Stillings explores dynamic interactions between raw organic forms of nature and those defined by the project's precise geometric lines. 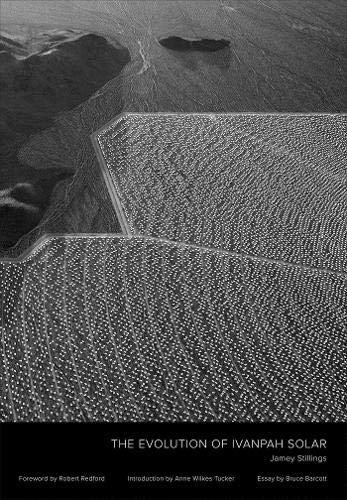 Shot from a helicopter during first and last light, Stillings' black-and-white images intrigue with tight abstractions, oblique views of geologic and geometric forms, and broad open views of the dramatic desert basin.